This post is also a published article, but it was so much fun to write, I had to share. Perhaps it’s the bawl of a new calf. Or it could be that overprotective mother cow. (Her calf’s ID is not a tag, but a crisp new rope.) Maybe its heifers that always seem to calve at night….But when calving season hits, so do memories of impending parenthood. For it was roughly eight years ago when my husband and I found out it wasn’t just the cows who were going to experience the miracle of birth. “Are you sure?” The brim of my husband’s hat dropped with his jaw. “That sure huh?” He began wringing his hands. We were pretty young. I was told my chances of having children were slim to none. We were shocked, yet truly overjoyed by our blessing. With the news of our pregnancy coming on the eve of calving season, my cowboy found himself in “baby mode.” He quickly whipped out his cattle gestation calendar and reported to me my due date. (What do you mean there’s a gestation difference?) He flailed his arms and spouted phrases like, just before weaning time, not during haying season, and maybe during a storm or full moon. He quipped that he would know just what to do because he’d helped many animals in my condition. It never occurred to him that I might not like being compared to a cow. I gently reminded him I was not some heifer. That’s when he put away his weight expectancy chart. Pregnancy does funny things to a woman. Those hay slivers that I continually brushed out of our bed began to irritate me. Anything but hamburgers made me gag. And cow manure on clothing—a fact of life—was not allowed within fifty feet of the house. “Don’t even think about kissing me until you’ve hosed off and stripped in the yard,” I found myself hollering. It goes without saying that pregnancy changes a woman, but it also changes a man. It certainly changes the size of his wallet. All of the things that are needed for a child add up: the four door pickup, the tractor with the enclosed, air conditioned cab, and the tack. Yet what first time parents don’t get carried away? At our initial doctor’s appointment my husband came with spurs on and his head cocked like a rooster. 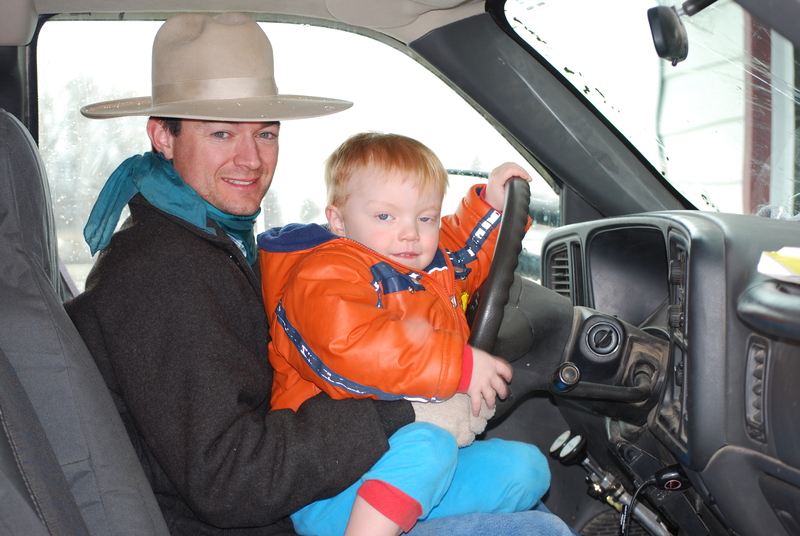 An early ultrasound was included, so my cowboy told me what to expect because he’d done ultrasounds for preg checking. Intuition told me the doctor was thoroughly impressed with my man, especially when the ultrasound procedure also included a complimentary bovine narrative. My cowboy actually went in to a mini-lecture on the similarities of my reproductive system and a cow’s. Maybe we could’ve saved money at Trans-Ova, the local cattle embryonic center. Once my belly began to bulge, so did my man’s ego. Why read baby books when he’d seen a million bovine births? It wouldn’t be that different…would it? One “difference” came when the baby began kicking. My husband put his hand on my belly expecting to feel a small tap and was blown away when the baby actually moved his hand with a forceful little blow. This was the first time I heard him scream like a little girl. The second scream occurred in Lamaze class. It was not the videos that made him holler. No, it was another forceful blow—this time by another expectant mother who didn’t tolerate bovine comparisons very well. Needless to say, we didn’t make any lifelong friends there. The calf-pulling conversation didn’t help. When our daughter arrived, cowboy instincts let loose and he nearly fainted. The man can castrate a steer, pull a calf, and inspect afterbirth….but a human umbilical cord made him woozy! All of his jitters passed away though when our beautiful girl was placed in his arms. Pride has been taken to a whole new level from this time forward. Stories of tagging, penning, and roping will always make a cowboy beam, but a child is like all of these tales and then some. Put some cowboy daddies together and they can talk! Even with their stories though, cowboys do make great fathers. They help their kids learn about life via the ranch. They teach them to make hay forts. They encourage them to open gates. The only thing that continues to puzzle me is this: How can a cowboy be immune to the stench of manure, stick his hands in the tightest of places, but changing a diaper induces tears or vomiting?